It was a day of solo shows at Toronto Fringe yesterday, starting with Gavin Crawford: “Friend” “Like” #Me, written by Crawford and Kyle Tingley, and directed by Tingley – running at the Annex Theatre. YouTube. Facebook. Twitter. Cellphones. We sure are attached to our social media platforms and mobile devices – often emotionally so. Gavin Crawford: “Friend” “Like” #Me is a smart, funny and thoughtful look at our attachment to devices and social media – and how we relate to each other. 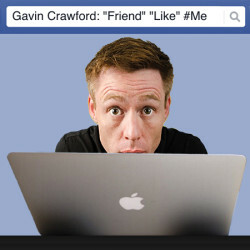 Gavin Crawford: “Friend” “Like” #Me runs at the Annex Theatre until July 9; see the show’s Fringe page for dates/times. The house was packed last night, so advance booking strongly recommended. In the meantime, give Gavin Crawford a follow on the Twitter.